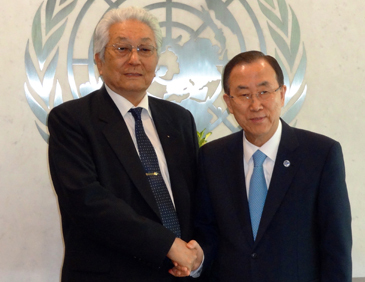 N. Korea's IOC member Chang Ung (left) meets with UN. Sec. Gen. Ban Ki-Moon in New York. I think that it is important for you or your staff to know some background information on Taekwon-Do in North Korea: It was only introduced there in September of 1980 by General CHOI Hong-hi, a retired (2 Star Major General) of the ROK Army. He was also a founding member (Serial #44) of the ROK Army, graduating from their 1st Academy class in 1946. He was also the 1st ROK Ambassador to Malaysia (1962-64). General CHOI was the founder of Taekwon-Do, naming it in 1954 after a famous demonstration in front of then President Seung-man RHEE. The occasion was a celebration of both his birthday & the anniversary of the formation of the 29th Infantry "Fist Division", which General CHOI. General CHOI formed the "Fist Division" on JeJu Island along with Col. NAM Tae-hi, who was the main instructor and Sgt. HAN Cha-kyo, the assistant instructor. JeJu Island was the "womb or cradle" of Taekwon-Do. There is a monument still displayed on JeJu Island commemorating this fact. (I have photos of the monument if you wish!) 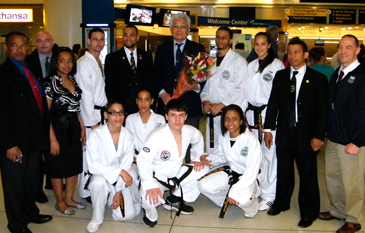 The monument at one time was knocked down, but it has since be restored by the local people who are proud of this fact.
. Korea's IOC member Chang Ung (center back row holding flowers) poses with Taekwon officials and representatives from other countries at JFK International Airport in NYC. It was hidden as General CHOI became an outspoken critic of the military dictatorships and the generals that ran the ROK for such a long time. As a result of this criticism General CHOI exiled himself to Canada in 1972, at the height of the brutality of the Park regime. He applied for political asylum and was granted Canadian citizenship. He lived there (Toronto) until he passed away in 2002. General CHOI led the 7th International Taekwon-Do Federation (ITF) Demonstration Team, which included 2 Americans to North Korea in 1980. After 3 very successful exhibitions, Pyongyang agreed to accept the Original Taekwon-Do that he first developed in the ROK Military. So it is ironic that the DPRK now trains and dispatches instructors worldwide teaching Taekwon-Do from South Korea. Of course once General CHOI exiled to Canada, the World Taekwondo Federation (WTF) was formed the next year in 1973. Because of his opposition to the military rule in South Korea, General CHOI was blacklisted in South Korea and written out of most of the historical accounts of Taekwon-Do's development. More often than not, many in South Korea and globally understand incorrectly that Taekwon-Do is 2,000 years old. Nothing can be further from the truth, as it was a mid-20th Century development. Of course Korea did indeed have indigenous fighting systems or their own martial arts back in the older times. However there simply is no direct connection to Taekwon-Do. Additionally and because of politics, the original Taekown-Do which has Chon-Ji, Dan-Gun, Do-San, Won-Hyo, Yul-Guk, Chung-Gun, Toi-Gye, Hwa-Rang, Chung-Moo, all the way up to the final Poomsae, Tong-Il, is not that prevalent today in South Korea. While it is making a comeback, it is really dwarfed by the WTF and Olympic Sport Taekwondo, which was originally called Tae Soo Do. As you may know the Chosun Taekwon-Do Demonstration Team performed in South Korea back in 2002 and 2007. They also came to the USA in both 2007 and 2011. These were the first cultural exchanges between the DPRK and the USA. After the 2007 one, the New York Philharmonic Orchestra played in Pyongyang in 2008. I think it is entirely appropriate that Taekwon-Do, Korea's greatest gift to the world, was the vehicle of these historic cultural exchanges, as the USA has the most Taekwon-Do students in the world. In fact U.S. Ambassador Robert King (Special Envoy to North Korea on Human Rights) went on record (and camera) praising the Taekwon-Do Diplomacy efforts, stating "you are doing God's work"! I remain available to provide any additional information you or your staff may need! The 3rd International Forum on Sport for Peace and Development took place in New York with the International Olympic Committee (IOC) honoring United Nations (UN) Secretary-General Ban Ki-moon with the Olympic Order. The award was in recognition of the UN Secretary-General’s strong personal commitment to use sport as a tool for social change, a concept brought to life through various joint IOC-UN projects at community level. It was also under Mr. Ban that the IOC received UN observer status in 2009.The UN Secretary-General and IOC President Jacques Rogge delivered keynote speeches at the Forum, held for the first time at the UN headquarters. The 3rd International Forum on Sport for Peace and Development was held at the UN headquarters in New York on June 5th and 6th 2013. Jointly organized by the IOC and the UN Office on Sport for Development and Peace (UNOSDP) along with the support of the United States Olympic Committee (USOC). In the framework of promoting peace through sport and the Olympic ideal, the IOC established an International Olympic Truce Foundation (IOTF) in July 2000. Through this global and symbolic concept, the IOC in part aims to use sport to establish contacts between communities in conflict and to create a window of opportunities for dialogue and reconciliation. "Sport alone cannot enforce or maintain peace. But it has a vital role to play in building a better and more peaceful world." Dr. Jacques Rogge, IOC President, October 2007." "Sports by its nature may be competitive, but sports can be a very powerful tool and vehicle to promote dialogue and peace and reconciliation." "Unfortunately we are experiencing problems in many parts of the world, but through sports we can promote peace and dialogue and reconciliation. This is exactly what the United Nations and the IOC share - the same goals and objectives," said Ban Ki-moon, UN secretary general. International Olympic Truce Foundation is made up of IOC and UN personnel, along with certain heads of international federations, National Olympic Committees, athletes, former players, noted sports personalities as well as members of non-governmental organizations. The IOTF also appoints those people who they believe will help promote the objects of the Foundation. Among those on the committee in this category are Mr. Adolf OGI, Former President of Switzerland, HE Mr. Thorvald STOLTENBERG the Former Minister of Foreign Affairs for Norway and Dr. Ung CHANG the IOC Member from North Korea and President of the International Taekwon-Do Federation (ITF). Readers may remember that General Choi Hong-hi, the founder and first President of the ITF, who many look to as the founder of Taekwon-Do, personally selected Dr. Chang to succeed him as the ITF President. Of course it was General Choi’s wish to use his Taekwon-Do as a vehicle to build a more peaceful world. It is of course the ultimate goal of ITF Taekwon-Do, as clearly stated in the final line of the Student’s Oath – “I shall build a more peaceful world”! Apparently the IOC and the UN agree with General’s Choi assessment and selection of Prof. Chang, PhD. The ITF President was an invited participant, assisting the IOC President with this all-important event. Inquiries can be made through this Email.